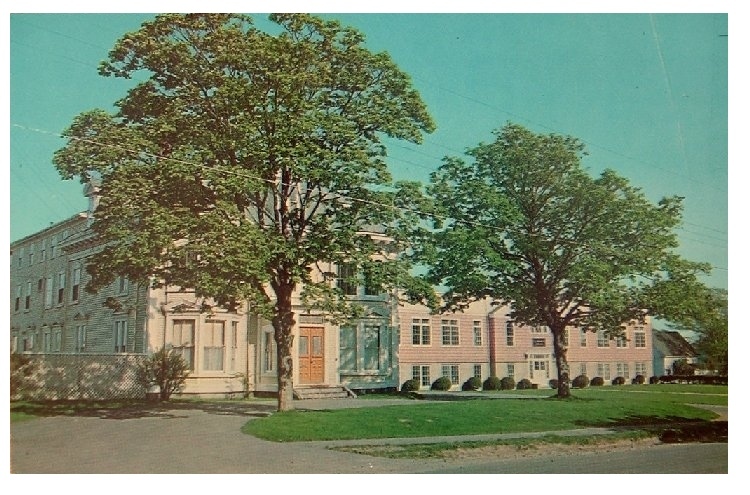 The first Catholics to settle in the Yarmouth area, were a group of French inhabitants of Annapolis Royal (Port Royal), who settled at Chebogue, around 1739. They were attracted by the prospects of good fishing. There was also a settlement of Acadians at Chegoggin, around the same time, but it, like the one at Chebogue, was terminated by the Expulsion of the Acadians in 1755. When writing his History of the County of Yarmouth, in 1876, J.R. Campbell states that there still could be seen remnants of the foundations at both locations. In 1761, English families from the New England states began arriving, taking advantage of a generous offer of lands, by a proclamation of Governor Lawrence of Halifax. These first families occupied the cleared lands left by the Acadians. The Town grew very slowly at first, because it states that, in 1793, there were but 28 houses from Wyman Road to Milton. In 1805, it had grown to a mere 38 houses, some 220 persons. In 1766, hardly 5 years after the New England settlers began to arrive, an Irish Catholic by the name of James Gilfillan, from Londonderry, Ireland, settled on a plot of land near Bunker Island. The name of Patrick Sullivan appears in accounts around 1784, having settled in Sand Beach. Early in the 1800s, a slow but gradual influx of Irish Catholics settled in Yarmouth, arriving by a variety of routes, including shipwrecks. Dominic McDevitt was a tailor, who lived on Queen Street, near Main Street. It was in his house that Mass was occasionally celebrated when a Catholic priest would stop by. Then there was Edmund Lonergan, merchant, who came from Halifax. His home was on the northwest corner of Lonergan’s Lane, and Mass was occasionally celebrated there also. Late in 1845, Edmund Lonergan bought the workshop of one Benjamin Bingay, on the south side of lower Barnard Street, and, the following year, transferred ownership to Father Carmody, the Wedgeport pastor (1845-1848), who had it remodelled for a church. It was named All Saints Church. then changed to St. Ambrose Church. 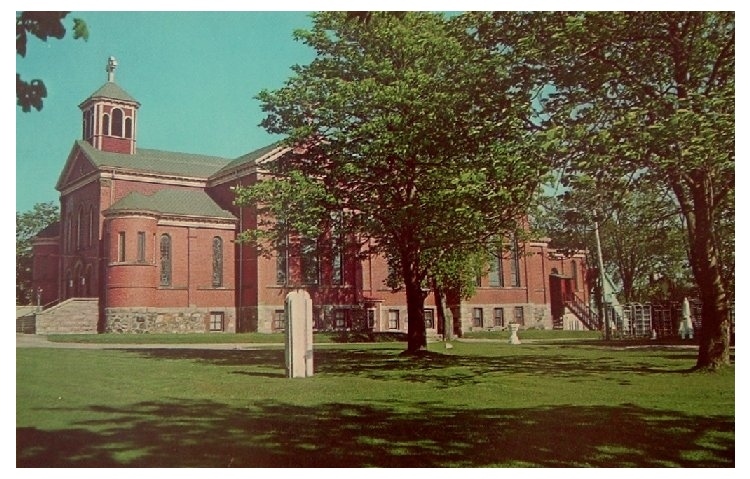 Without a resident priest in those early years, the small Yarmouth Catholic community depended on the pastors of St. Michael’s Parish, Wedgeport, to celebrate Mass in their remodelled church. The first Catholic cemetery (now called St. Ambrose Cemetery, on Kempt Street behind South Centennial School) was blessed on September 26th, 1849 by Archbishop Walsh. 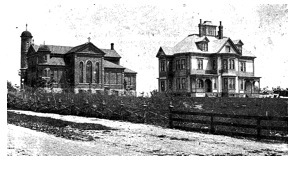 The Catholic community continued to grow, so, in 1860, while Father John J. Quinan served the area, plans were drawn up for the erection of new church on the same site. 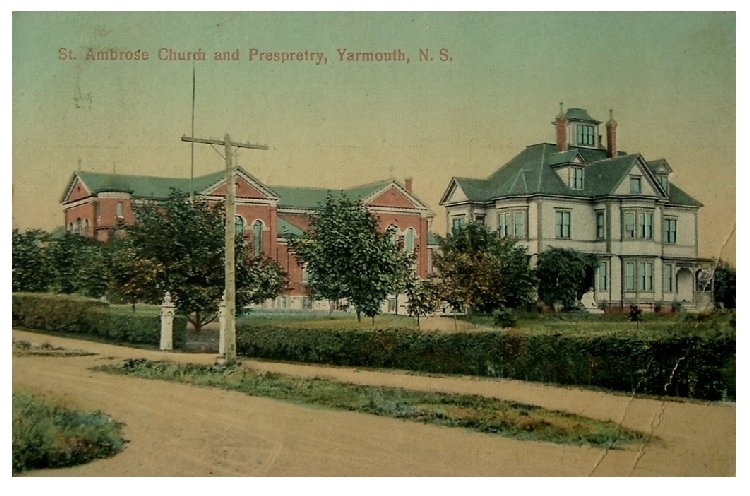 As this church was being built, the Town of Yarmouth celebrated its 100th anniversary with parades, outings, concerts and speeches. 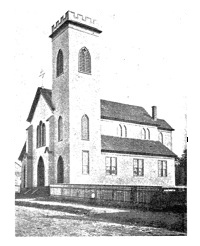 The new All Saints Church was completed by 1862 and remained the center of Catholic worship in Yarmouth until 1889. In 1883, Father Edward J. McCarthy was named pastor and had the name of the parish changed to that of a renowned doctor of the Church, St. Ambrose. 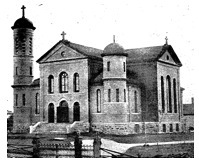 With remarkable vision, he purchased a large piece of land on Albert Street, and supervised the construction of a new brick church, whose cornerstone was laid and blessed on July 8th, 1889 by Archbishop Cornelius O’Brien. 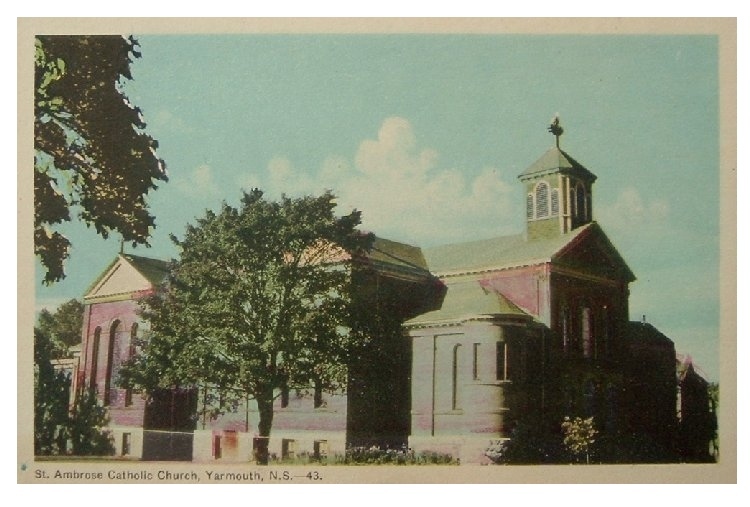 On June 1st, 1908 while Father William E. Young was pastor, work began extending the brick church to almost twice its original size, and 2 years later, the now Archbishop Edward J. McCarthy returned to his former parish to dedicate the extension to the edifice he had built some 2 decades earlier. the towers of different Heights and the metal gates. was about 11 years old. Note the short length of the church. Note, also, the absence of trees and a driveway.